You’ve pictured it a million times. The roar of the crowd as you take the stage. The feeling of looking out at a sea of people, eager eyes, hands in the air. The first chords echoing through the festival. That overwhelming feeling of being on top of the world. It’s kind of incredible isn’t it? For many, playing the festival circuit can be a gateway to so many future opportunities. Beyond the incredible feeling of taking the stage to hundreds or thousands of eager fans, it can lead to more (and larger) bookings, new team members (like management), and of course it doesn’t hurt if you’re looking at signing to a label down the line. But when it comes to actually making the connection and securing your spot, how does it work? We've put together a guide to getting booked at major festivals complete with advice from our in-house experts about giving yourself the best chance for success. Read on! Let’s tackle the big one right out of the gate. If you’re here, you’re probably wondering what you need to do to get noticed and make an impression on the festivals you’re applying to. Unfortunately, there's no magic answer — it's the same tried-and-true technique you've likely heard before, but it really is the best thing you can do — own your market and engage your fanbase. If you're a Boston band dominating the Boston scene, festival bookers will notice. If you're not playing out a lot or you can't get a decent draw in your hometown, they’re going to notice that, too. Do the work, and people will notice. This next one will be a relief to a lot of artists — contrary to popular belief, it isn't all about your following. While having a strong following and engagement isn't going to hurt you, it's more about the organization of your project. It's about the way you present yourself. You want to show that you can put on a good show and engage a crowd, so having professionally made videos (not phone recordings) of you entertaining a crowd can go a long way. Also, keep track of the shows you've played on your EPK so that bookers know you're active and can see your lengthy history. Next, have a live show strategy, like playing the same venues to show you have a following there. While there's no set timeline, most festivals are booking earlier and earlier these days — major acts have locked in their summer dates by late January, and smaller festivals will book up to two months before the show date. Make sure you're giving yourself plenty of lead time and researching festivals six-plus months in advance. Ideally, you’ll want to put together a spreadsheet that includes the festival name, city, application due date, and any other pertinent notes like who you need to contact. (Hint: you want to look for the talent buyer or booker.) Having a spreadsheet and marking due dates on your calendar will help keep you on track and make sure you aren’t missing any important deadlines. Say I land a festival spot — do I have room to negotiate pay, slot time, etc.? The harsh reality is, if you aren't signed, you're lucky to be playing a major festival in the first place. Always be respectful throughout the process to the organizers as well as the behind the scenes staff. As you grow, there will be time for more negotiations but for now, just enjoy the moment and the opportunity to be in front of a crowd that you wouldn't have otherwise had access to. While some fests will have open submissions, bookers are flooded with requests, and so your best bet really is something like Sonicbids, which gives you that direct access to the organizers. Because we work closely with the festival and know exactly what they're looking for, the process is not only easier than reaching out yourself, but you're more likely to get noticed. Ready to get booked at a major festival? 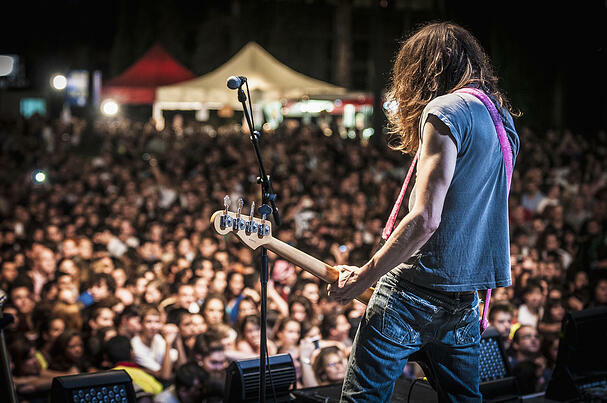 Use our "festival finder" to see the latest and greatest fests looking for Sonicbids artists!